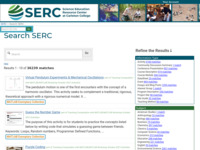 Click the images above to browse teaching activities, course descriptions, and essays related to sustainability topics. Collections are contributed by faculty and include service learning projects, writing assignments, field trips, course descriptions and syllabi, as well as faculty essays on a range of sustainability issues. InTeGrate: Interdisciplinary Teaching of Geoscience for a Sustainable Future - This is a community effort to improve geoscience literacy and build a workforce that is prepared to tackle societal issues. 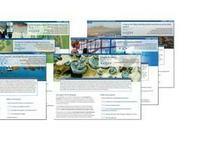 Find teaching materials, information about successful programs, and upcoming workshop pages. This 5 year project is a NSF STEP center grant and will run from 2012 through 2016, with many pathways for faculty involvement and collaboration. 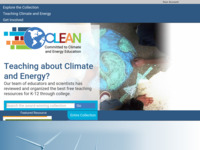 Climate Literacy and Energy Awareness Network (CLEAN) - The CLEAN project, a part of the National Science Digital Library, provides a comprehensive collection of climate science and climate literacy resources for students in grades 6-16 and informal citizen learners. The overarching goal of the CLEAN Pathway project is to introduce standards-aligned "civic science" materials to promote responsible energy use and planetary stewardship for a sustainable future. 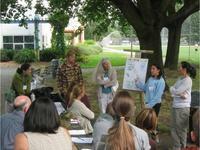 Curriculum for the Bioregion - This is a network of educators in Washington State who are integrating sustainability and place-based content in a broad array of undergraduate courses. The site hosts collections of teaching activities, course descriptions, and essays with approaches to curriculum integration and engaging pedagogies for both classroom- and community-based learning. Sustainability Improves Student Learning (SISL) focuses on resources for teaching sustainability from interdisciplinary and disciplinary perspectives. For those new to incorporating sustainability into your teaching, start with the beginner's toolkit. There is also pedagogical information for designing sustainability assignments. Developing Student Understanding of Complex Systems (from On the Cutting Edge) - This collection begins with a detailed explanation of the characteristics of a complex system which include many interdependent variables, feedback loops, chaotic behavior, etc. The collection also presents pedagogical strategies, activities, and course descriptions, essays and much more about addressing complex systems. Materials and Strategies for Teaching about Geoscience and Societal Issues (from InTeGrate) - Aimed at undergraduate faculty from across all disciplines, InTeGrate resources aim to bridge societal issues, sustainability and geosciences. Resources cover a breadth of topics and include teaching activities and course descriptions about energy, water, and food. Teaching Energy with Quantitative Skills (from On the Cutting Edge Teaching about Energy) - This resource contains a collection of activities using quantitative skills to teach about energy. Many energy concepts are quantitative, such as rates of consumption and production, the costs of energy and comparisons of energy usage. Using a quantitative approach is an effective way to cut through political or emotional responses to energy topics. Carbon Footprint Collection (from On the Cutting Edge Teaching about Climate Change) - This collection contains carbon footprint exercises appropriate for introductory level students via ready-made footprint calculators, or left as open-ended calculations in upper level courses. Limits to Growth (from On the Cutting Edge Teaching Environmental Geology) - At the 2012 workshop on Teaching Environmental Geology, participants read and discussed the concepts from Limits to Growth: the 30-Year Update, by Meadows, Randers, and Meadows (2004) including food, water, forests, fossil fuels, materials, and pollution. 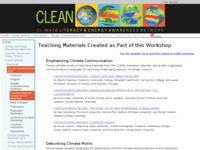 Communicating about Climate Science (from CLEAN Communicating Climate Science in the Classroom) - At this 2012 workshop, participants created two sets of teaching materials. 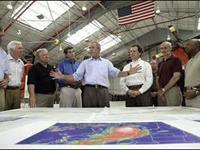 One set of 4 activities deals with "Emphasizing Climate Communications". The other set follows the theme, "Debunking Climate Myths". These pages present strategies for addressing common climate misconceptions in the classroom. On the Cutting Edge Climate and Energy Webinar and Book Club Series - This monthly series delved into emerging topics in the science of energy and climate and explored promising teaching approaches for these topics. Recordings of webinar presentations are available from the event pages. 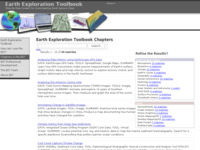 The Earth Exploration Toolbook - The Earth Exploration Toolbook has a number of data-rich activities designed for high school classrooms including chapters related to atmosphere, biosphere, climate, Earth cycles, oceans, and more. 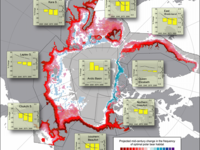 Teaching Climate Change (from On the Cutting Edge) - Presents activities, courses, and resources pertaining to teaching climate change including information on teaching about Ice Cores and Paleoclimate. 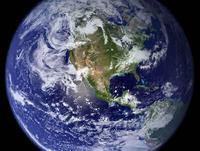 This collection also includes an extensive list of web based resources for teaching climate change. 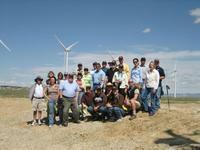 Teaching About Energy (from On the Cutting Edge) - Aimed at undergraduate geoscience faculty, these resources are for getting started or improving teaching about traditional and alternative energy sources along with activities and courses addressing energy. 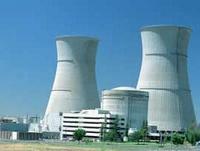 Includes a rich selection of visualizations on energy sources and generation of energy. Teaching Public Policy in the Earth Sciences (from On the Cutting Edge) - Presents information and activities on incorporating public policy issues into science courses. Includes an extensive list of web resources and several examples of role playing scenarios that are useful for teaching about public policy. Geology and Human Health (from On the Cutting Edge) - Geology is intertwined with human health issues: water and air, climate change, and more. These resources include teaching activities, visualizations, and other resources recommended by faculty to facilitate effective teaching this important topic. EarthLabs - This extensive collection is designed to assist educators in teaching how the earth system functions through five Earth Science units; Corals, Cryosphere, Drought, Fisheries, and Hurricanes. Earthlabs contains rationale for teaching with an Earth System approach, goals and objectives for each of the five units, and several lab or hands-on activities for each unit. 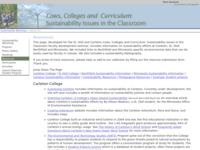 Cows, Colleges and Curriculum: Sustainability Issues in the Classroom - This set of pages includes sustainability-related courses, activities and a list of approximately 125 resources. The list is broad in coverage, but about one third are specific to Northfield or Minnesota. In the activities and courses collection, disciplines represented include: American Studies, Environmental and Technology Studies, German, History, Political Science, and Sociology. Interactive Webinars for Teachers of Grades 6-12 - Part of the CLEAN collection, this page includes recordings and slides from webinar series aimed at middle and high school teachers. 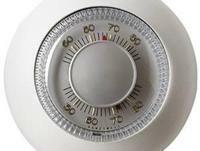 The webinars addressed a variety of topics within climate and energy. 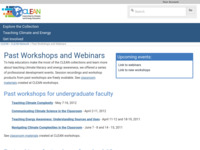 Each session was designed for teachers to gather information about science, see example teaching materials from the CLEAN collection, and consider classroom strategies that are particularly suited to these topics. Teaching topics of sustainability requires a broad understanding of many facets of the Earth system and benefits from active learning strategies to all students to become engaged in these complex and potentially controversial subjects. 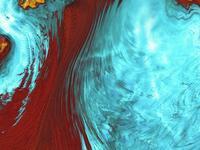 Sustainability topics are intertwined and do not resign themselves to a particular discipline. This selection of pedagogical approaches lend themselves to effective sustainability teaching and learning. Teaching Environmental Issues and the Affective Domain (from On the Cutting Edge The Affective Domain in the Classroom) - This web page offers some strategies to teach environmental topics, particularly controversial ones, without coming up against affective barriers to learning. The page also offers a collection of examples, teaching methods that work well with teaching about controversial environmental issues, and a list of related links and resources for further information. 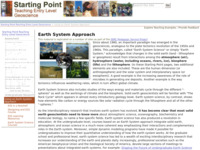 Using an Earth System Approach (from Starting Point) - The Earth System Approach acknowledges that changes in the solid earth can impact the atmosphere, lithosphere, biosphere, or hydrosphere. 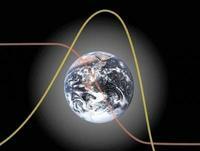 This resource presents information on how and why to create an earth system course. Interdisciplinary Approaches to Teaching (from Pedagogy in Action) - Many aspects of sustainability are interdisciplinary. 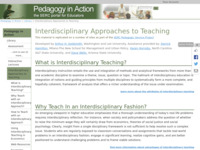 This resource provides a step-by-step guide of how to make your course interdisciplinary, ideas for assessment, and examples of types of courses that lend themselves to being interdisciplinary. Service Learning (from Starting Point) - In service learning, students couple classroom learning with a community based partner through a project. This helps students understand the broader impacts of issues and the applications of classroom learning while building community relations. Service Learning in the Geosciences (from On the Cutting Edge) - This collection of pages offers tips for creating and implementing a service learning project in your course. 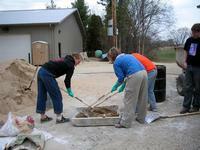 It also offers examples of service learning activities contributed by the community. 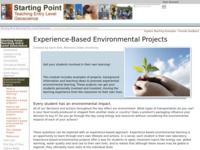 Experience-Based Environmental Projects (from Starting Point) - Experience-based environmental learning presents an opportunity to learn through one's own lifestyle and actions. Students apply classroom topics to realize that although issues may be global or regional, they ultimately have roots at the individual level. An example is the lifestyle project. 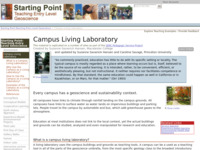 Campus Based Learning (from Starting Point) - This module explains how educators can use the campus grounds to link theoretical learning with a local physical example. This helps students see how the sustainability concepts they are learning affect them directly. Examples are presented on how to use the campus in small and large scales. Structured Academic Controversy (from Pedagogy in Action) - This cooperative learning strategy ties together multifaceted issues with a sociological perspective wherein small teams of students learn about a controversial issue from multiple perspectives. Teaching Urban Students (from On the Cutting Edge) - Students from urban backgrounds have different connections to the land than students from rural backgrounds. Making sustainability issues more meaningful for urban students means using urban students' vast understanding of the urban environment as a backdrop for introducing ideas about the natural world. Science Education and Civic Engagement: International Journal - Articles on teaching sustainability in science, math, and teacher preparation courses. Articles include best approaches to integrate sustainability, the outcome of using service learning practices on student learning, and more.